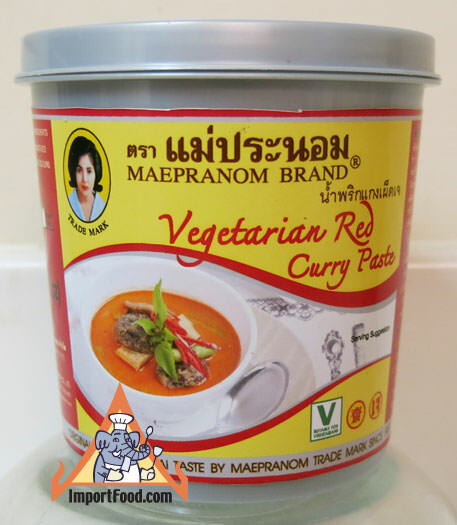 Mae Pranom's new product is vegetarian curry paste with excellent authentic flavor. "Fry 100g vegetarian red curry paste with 2 tbsp vegetable oil on medium heat. Still well until aroma is achieved then lower the heat. Stir in gradually 2 cups coconut milk. Add 130g vegetarian protein (such as tofu), stir until cooked. Then add 3 cups water and bring to a boil. Add 1 cup green beans, 1/2 cup eggplant, and 1/4 cup mushrooms. Season with 2 tbsp palm sugar and 2 tsp thin soy sauce, stir well. Add 2 cups fresh basil and garnish with fresh red chilli. Remove from heat and serve with steamed jasmine rice." Ingredients: dried chilli, galangal, lemongrass, kaffir lime peel, spices, soybean paste, salt. No preservatives. No artificial colors. No msg.